manual dexterity, visual abilities, ease of use, and cosmetics. In today’s world, there are many different styles of hearing aids (the way they look) and technology levels (basic, mid-level and premium). We will discuss features such as Bluetooth® and other wireless connectivity devices to enhance your listening experiences in a wide variety of situations. We look forward to helping you HEAR BETTER, COMMUNICATE EASIER AND LIVE FULLER! We look forward to meeting you and completing a thorough diagnostic evaluation. If the results of your hearing evaluation indicate you would benefit from hearing instruments we’d like to provide you with some information about hearing aid technology prior to your appointment. Selecting a hearing aid can be an overwhelming process which is why it is important to work with an audiologist who will take the time to understand your individual needs and help you make the best choice for you. A recent and thorough audiological evaluation is a critical first step towards finding the style of hearing aid that is most appropriate for one’s type and degree of hearing loss. We will review the implications of any hearing loss identified on your examination and help you identify your most critical goals to HEAR BETTER, COMMUNICATE EASIER AND LIVE FULLER! 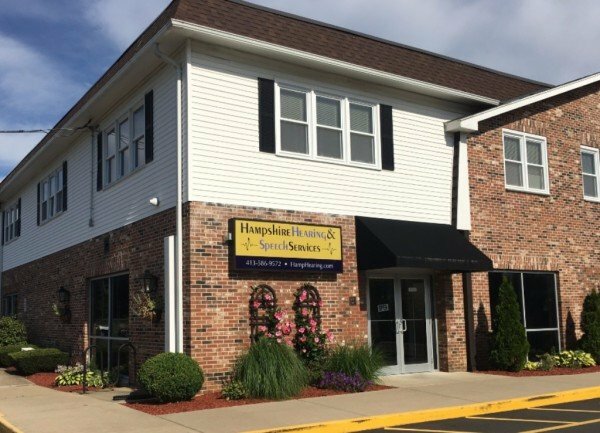 Hampshire Hearing and Speech Services is proud to be independently owned and operated. This allows us to work with a variety of hearing aid manufacturers that we trust because they offer reliable products and excellent customer service which allows us to in turn do the same. Digital hearing aids with directional microphones are now standard and allow your audiologist to customize the programming of the computer chip inside the hearing instrument according to your hearing levels and process incoming sounds very quickly (over 100 times per second). Unlike hearing aids worn by your parents or grandparents that seemed to make all sounds (including noise) louder or softer, we are now able to focus on improving the clarity of conversation. Understanding what others are saying especially in restaurants or other noisy situations can be the most challenging for many individuals with hearing impairment. Hearing aids will never eliminate background noise but they are performing better than ever to help you understand your dining partner. There are options for rechargeable hearing aids, connectivity to your cell phone and/or other Bluetooth accessories that can make adding new technology to your life even more exciting. We offer a complete line of sizes and styles to meet your hearing level needs, in appealing colors and a range of state-of-the-art technology levels from multiple manufacturers to match your listening goals and budget. Keep in mind, everyone’s hearing loss is different and listening needs are unique, so what we recommend for you may be quite different for what we recommend for someone else. Depending on the style you choose, you may need to have impressions made of your ears. Included with the purchase of your hearing instruments is a 30-day trial period, 3-year manufacturer warranty as well as 3 years of professional service from Hampshire Hearing and Speech Services. We are committed to providing exceptional care not only during your consult and initial fitting but also with regular follow-up care and maintenance to ensure you get optimal benefit for years to come. The most helpful thing you can do prior to your appointment is think about how you spend your time, who you would like to hear better and how can we help you improve your quality of life. We encourage you to bring a spouse, friend or loved one with you to your appointment as they can provide input and perspective and offer you support both during and after your visit.